Everything in the world was started with an idea. The power of an idea and therefore the power of creation lies within each of us. Most people limit their thinking by staying within the boundaries of their conditioning. This program stimulates creativity by reconditioning the subconscious to produce creative thoughts. It also helps develop a conscious awareness of those creative thoughts, so you won't be inclined to disregard "hunches" which may be the beginning of a million dollar concept. 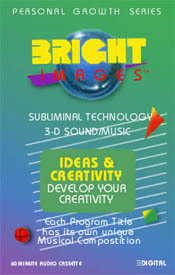 Using this program, you will be able to reap the unlimited potential of your mind take advantage of your own creativity. You are a naturally creative person. You think of new and exciting ideas that your mind puts together. You will believe in your own ideas which is all you need to make them reality. You will direct your creativity into all areas of your life. In this fast acting program, every affirmation contains a form of either the word "idea" or the word "creativity".